Happy spring and happy Easter! To celebrate, I have a whole colony, or fluffle, of stuffed bunny rabbits over in my toy shop! I have Hug Me Bunnies and Wonder Bunnies in lots of colors. You can hop on over to my toy shop to adopt one or two. Please don’t give real bunnies as gifts for Easter! Rabbits are a big commitment and a lot of work. They are definitely not “starter pets”. They need lots of love and attention, like Oliver Bunny does. Hug Me Bunnies, however, are very easy to take care of, and they are cuddly. I brought some Hug Me Bunnies to Rabbit Day this year, and two of them were adopted by Louise and Arthur, two real bunnies. They come in all colors, even apple green. I started an Instagram page, if anyone would like to follow me there. I’m on Pinterest too. I am in the process of trying to figure out how to start a mailing list/club as well. I will post the details as soon as I figure it out! If anyone would like to make an Easter or a spring basket, like mine at the top of this post, here are some instructions. I got some floral foam. I got “wet foam”, but that isn’t necessary because I used pretend flowers. It’s called wet foam, because it is used for fresh flower arrangements, to keep them hydrated, but I didn’t wet it! The block just happened to work for the size of my basket. I set my basket on top of it, and carved away the excess with a knife. It was very easy to cut. Then I put the block into a plastic bag so the bits wouldn’t get everywhere, and I sealed the bag. I cut my flowers away from their central stem. They are wired, and so you will need a tool that cuts wire, like a pair of side-cutting pliers or wire cutters. I tried to cut them at an angle, to make it easier to insert them into the foam. I put my bag of floral foam into my basket, and poked my flowers right into the foam through the bag. If you need to pull them out to reposition them, just poke a new hole. I left some space in front of the flowers for my bunnies. The bow is made from wired ribbon that was made into big even-sized loops and then pinched together in the center with a big pipe cleaner. The ribbon could be wrapped around a big tube or jar to get the loops even, with the tails hanging free. The loops are pulled into shape and arranged as desired. I added a bunny ribbon around the rim of the basket. I set two Hug Me Bunnies in the basket, and I was all ready for Easter. Guess who was featured in the Brown Alumni Magazine Holiday Gift Guide for 2017? My Hug Me Slugs! I submitted them to Brown Alumni Magazine for their annual holiday gift guide on almost the last day for submissions, and was surprised when Kerry Lachmann, who is in charge of the magazine’s annual holiday guide, wrote back in little more than an hour, accepting them and asking me to send them along to Providence, RI. She said, “The slugs are absolutely adorable! Can’t wait to see (‘meet’) them.” Thank you, Kerry! I was very excited, and I think the slugs were too. I mailed them to off to Brown University, and when they arrived, I got another message from Kerry, saying, “They have arrived and they are adorable!!! I took them around the office and introduced them to the staff (-: So sweet. Thanks!” The slugs must have been eating up all that attention. They have to compete with the cats and the bunny around here. This week, the print issue of the 2017 December/November Brown Alumni Magazine arrived, and there they were, peeking out from the page. They are back home now, and in my toy shop, waiting to be adopted. Here are some wintry photos of the Brown University campus. I walked through these gates every day my first year there, on my way across campus to go get my mail, or head to class. This is the main campus. In the warmer weather, it is covered in students. These are the Van Wickle Gates. It is customary for first-year students to walk through them when starting at Brown, and then again when graduating. I participated in neither march through the gates, I have to say. I was a transfer student from Yale, and I went home before graduation! Here I am home on Christmas break from Brown. I think I had just turned twenty-one here. I was wearing a headband that only just fell apart a few weeks ago, and is lying on the chair next to me as I write this. My mom was always trying to get me to take that thing off. Ha. It does look silly. I came home with a cat from Brown. Her name was Tishi. She accompanied me home on Thanksgiving break, my first year there. Someone had dropped her inside the gate around my dorm, and she was yelling at the basement window. I fed her turkey strips from the salad bar, which I sneaked out of the dining hall, until I was able to get some cat food. She stayed at home with my very tolerant parents who cared for her while I was away at school. I missed her, but she was safer there. Brown doesn’t allow pets in dorms. You aren’t supposed to steal turkey from the salad bar either, no matter how much your cat you aren’t supposed to have in your room likes it. Fortunately, they do allow Hug Me Slugs there. I have a bunch more I have been working on and posting in my shop. Please go have a look around. and kitty cat figurines too. I will try to post more photos of my toys in more posts. Sorry to have been missing all year. We lost my dad last Christmas Eve. Last year, we were busy caring for him, and this year, adjusting to his not being with us. Sending love your way and wishing you all a lovely holiday season. I’ve mostly been finishing toys people have asked for, when I’ve had a chance to finish any toys, but I do have these gray and lemon yellow Hug Me Slugs over in my toy shop right now. The apple green Hug Me Bunny was a custom order and is already adopted. They each have my new colored eyes. We’ve had a lot going on lately, and I haven’t been able to sew as much as I would like. I’ve been doing my dad’s physical therapy with him. He’s been very good about doing his exercises and walking, but his balance is sometimes off. He wakes up a lot at night, and I think he may have taken up sleep walking. I hear him wandering the hall at night. He makes coffee and feeds the cats, and doesn’t remember doing it. I’ve had to strike a balance between checking on him and sleeping because I can’t get up every hour and hope to function. Dad’s scan results were not what any of us hoped they would be, but we still need to have more tests to confirm what is going on. I am hoping he can resume physical therapy with a trained physical therapist to help him with his balance, but first we need to get more appointments out of the way. I’ll keep doing his exercises with him either way. Hurricane Junonimo had her spay surgery done. She went into heat early, which was a surprise. She didn’t agree with the idea that she needed to rest afterward, and kept racing around. There was no where to confine her where she would not jump on things. The area got irritated and she pulled out one of her stitches. The vet tech fit her with a cone, but she had it off by the time we got home. I tried two different cones and made her an embarrassing dress to wear. She would have none of it. My badly-designed Project Runway reject of a dress stayed on a little longer than the cones, but she got another stitch out. So, we took her to the vet, every other day, to make sure she was okay, until she had the remaining two stitches removed. She is fine now and has moved on to other mischief, like trying to march out the door whenever she gets a chance, and giving me back talk when I tell her to get off the kitchen counter. I took some friends’ suggestions to try Small Pet Select timothy hay for Oliver Bunny, since he is especially picky about hay. He chose it over his salad the first time I gave it to him. I see him munching on it, which is good. He has disagreed that bunnies are supposed to have timothy hay as the bulk of their diet. My pets all seem to have rebellious ideas. Trouble from next door also has rebellious ideas. He likes to see how close he can get to Santana without Santana noticing. 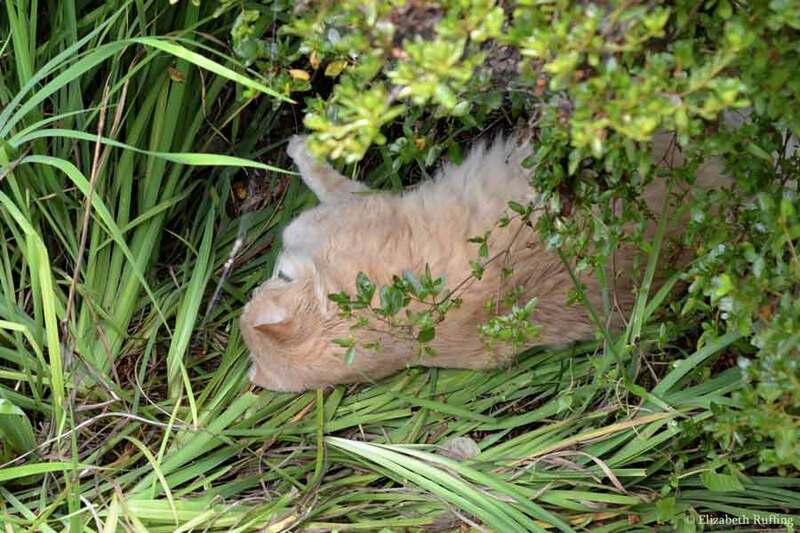 Santana likes to sleep in the garden, and Trouble tucks himself in as inconspicuously as he can, a couple of feet away. The other day, he managed to hide, unnoticed for hours off the edge of the deck, before Santana spotted him. One time I found them lying next to each other under my car. One night, Trouble was locked out of his house, and slept in Mr Bear’s house on the porch. Eventually, there was an argument. He likes to see how much he can get away with before Santana yells. He even sneaks food out of Santana’s bowl. I suspect he wants to be friends with Santana, but it doesn’t always work out well. His brother Scooter doesn’t bother being stealthy. He lounges in plain view. He and Trouble were coming over together for a while, when Dad’s physical therapist was making home visits, to watch Dad do his exercises. They both took a seat at the back door. They found it entertaining, most of the time. I have to get those capes on my Wonder Bunnies. I made more Wonder Bunnies, and now I need to make more capes.